I didn't do much to this except make it look like it was put on canvas, and did some cloning around the bright areas. Just liked the colorful effect. Nice one. I really like the presentation. 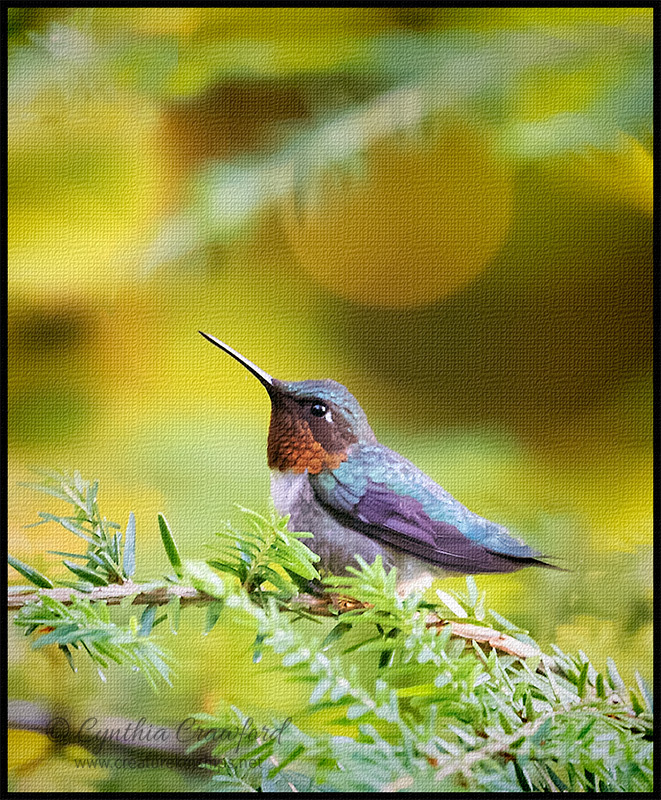 Really pretty looking hummingbird, too. Beautiful canvas texture and lovely color palette, Cindy. Great profile shot of the hummer capturing the illuminated gorget. I'm curious, what is the orange sphere above the hummer? Whatever it is, I thinks it is interesting and adds greatly to the image. Excellent work. This was taken at dusk. The sphere is a lens flare. When flattened by the texture it looks like a moon or something. The sphere definitely adds to the overall effect, Cindy! I thought it was perhaps an orange tree in the background. The end result is beautiful. Ha ha- that's a good one, Carol- an orange tree in Vermont! Love the colours in this as well as the hummer.